review The Wandering Fire is a worthy and satisfying follow-up to the first book in The Fionavar Tapestry trilogy that Canadian author Guy Gavriel Kay launched with a bang with his 1984 fantasy novel The Summer Tree. Readers who loved the first book (and we presume there are many) will want to proceed straight on to the next. 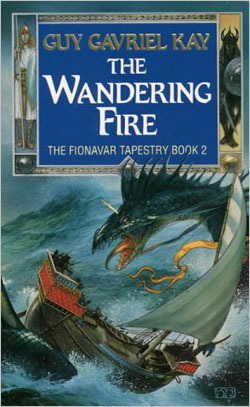 Note: This review of The Wandering Fire, the second book in Guy Gavriel Kay’s trilogy The Fionavar Tapestry, contains spoilers about the first book. You probably don’t want to read this review or The Wandering Fire itself unless you’ve read The Summer Tree first. Having said that, The Wandering Fire suffers in a small way many of the common problems that so-called “middle books” in trilogies tend to fall prey to. It’s possible to argue that Kay introduces too many actors into his narrative, deviating from the tightly woven character examinations of The Summer Tree. And plot threads – possibly too many of them – start to spread out from the main story. Some problems too, can be found in the unconstrained magic power sometimes granted to characters. But these are perhaps only minor quibbles. The Wandering Fire starts six months after the end of The Summer Tree. The five heroes from twentieth century Earth are back home, albeit with some quite large differences in some of their lives. Jennifer, for instance, is pregnant with the child of the dark lord, Rakoth Maugrim (which she is determined to give birth to), and Kim has been transformed from a normal medical intern into a seer with bleached white hair and a penchant for seeing the future, or distant present. Then there’s Paul, who has been led out of his depression by the transformational experience of surviving three days and nights hanging on the Summer Tree of the god Mornir, but is now grappling with what it means to be the chosen of the god. As might be guessed, it’s not long before our heroes are drawn back into the world of Fionavar, and to once again walk with gods and unearthly creatures, and of course to do battle with the servants of the Unraveller Maugrim. As the book moves forward, several major characters are introduced to its pages who were not in The Summer Tree, and others, who had previously remained quiescent in the background, move more to the front of the narrative. This, in my opinion, creates a bit of difficulty for the reader, who is mainly, after all, interested in viewing the struggle of the light and dark forces of Fionavar through the eyes of those who are new to the world and its magical nature; in other words, the five protagonists who have journeyed there from Earth. These characters shouldn’t be static, and their interactions and struggles should change them and help them to grow. But at times it can seem as though they have become fixed models after The Summer Tree. There is also a slight lack of believability to some of the magic acts accomplished in the book … at times it can seem like whenever the characters are in true danger, they can call upon the gods or their own (sometimes hidden) personal resources for a universal panacea. To create dramatic tension in fantasy books, the magic system needs to be fairly carefully built. When heroes are too powerful, they can too easily remove obstacles from their path. When they’re too weak, they get bogged down and are unable to escape their struggle towards safety. In The Wandering Fire, Kay perhaps erred too far on the side of power. The book also, in my opinion, doesn’t build so much towards its own conclusion as it does towards a presumably more climactic ending at the end of the third book in the series. It’s hard to create a middle book in a series that stands on its own right, and Kay has obviously aimed towards this goal, but more probably could have been done. The prose in the book remains excellent. As we’ve previously noted, Kay’s deceptively simple style hides hidden depths. At times the painstaking delicacy with which he places his words seems an art form. So many meanings, explicit or implicit, colour his words. Yet there are so few of those words. With some minor quibbles typical of “middle book syndrome” aside, Guy Gavriel Kay’s The Wandering Fire belongs on any fantasy fan’s bookshelf. We’re looking forward to the conclusion of The Fionavar Tapestry, The Darkest Road.